Anyway I digress. The point is, there are still places in the world where real adventures can be had, which can enrich the traveller and even have a positive impact on the community. That’s at the heart of what Filmmaker Abroad is about. In fact we think that we offer the most authentically experiential travel experience there is to be had. I feel comfortable saying there is no more immersive and enriching experience than making a doco in a remote and exotic location. The camera provides a privileged access to a place and people – by empowering the storyteller to delve into the community in a way that a tourist could never do. So, if money wasn’t your first consideration; if you craved that immersive experience in your next holiday; if you thought you’d like to try your hand at making your own documentary film; where would you choose to go? Can I make a suggestion? The trip starts in Anchorage, the State capital. You’ll soon realise you’re in a different part of the world, as you’ll be collecting your bags next to men dressed in camo jackets, hefting pelican cases filled with firearms and fishing rods, and loading huge polystyrene boxes filled with Red Salmon onto trolleys. My fixer tells me that she often sees Hollywood-types slipping through the airport, hats pulled down over eyes, as they set off for 'boy's own' adventures and the bliss of anonymity. It's like Australia in that way, no one gives a toss if you're famous or rich and, like Australian's, Alaskans think they live in the greatest place on Earth. We’ll probably stay a night here and take a stroll down the main drag lined with old-fashioned outfitters stores (fancy a plaid shirt and matching cap?) and bars, lots and lots of bars. No cafes, few restaurants, but that's alright, there's bar-food! It’s part of the experience of an Alaskan summer to do a bit of bar-hopping in the midnight sun. After the months of darkness the arrival of the long days of summer seem to whip the locals into - how shall I put this?- an elevated state. I’d describe the mood as ‘the world might end tomorrow, let’s make the f***ing most of today’. If you find yourself walking home at 1am in full sunlight, you won’t be alone. The flight down to Kodiak Island is short (even with a hangover) and – in the summer time at least – uneventful. Kodiak is sometimes called the Emerald Island (not sure how the Irish feel about that), about a third the size of Tasmania, two thirds of which is a wildlife refuge. To say this place is rugged undersells it. It’s like saying the bears here a big. They are so big some scientists consider them a subspecies. There’s a stuffed one at the airport that stands over 3 metres tall. His canines are the size of a man’s finger. But I don’t want to frighten you. 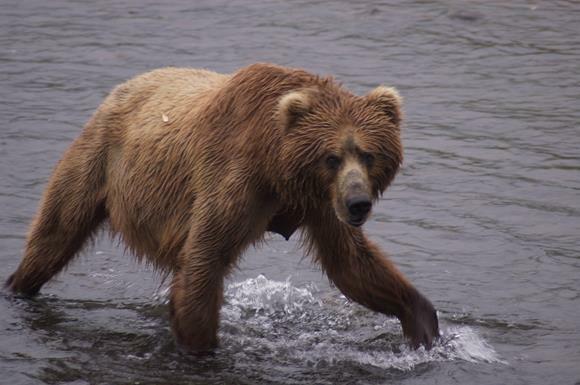 You are safe from the Kodiak bears - unless you’re a salmon, or really stupid. 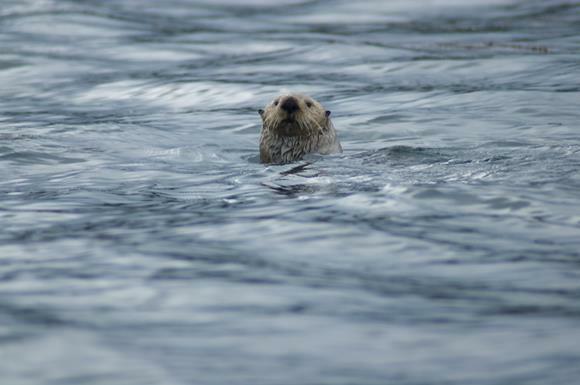 The township of Kodiak is small and relaxed. This is the home of the ‘Deadliest Catch’ fleet so camera crews are far from novel, but it’s not the town we’re here to see (having said that, I love the place, it's got the same frontier town frisson as Nome, but in a much more attractive location). Not far from the main airport is the flying boat airport, and what a beautiful thing it is; a series of docks lined with colourful float planes. This is the only way to access the lakes of the interior and that’s were we are going, in my favourite airplane of all time, the De Havilland Beaver. It’s not fast, it’s not new (in fact the controls are made from Bakelite and the dash is Art Deco in style) and it’s not very comfortable; but is there a more beautiful plane in the world? Well they say beauty is in the eye of the beholder. This may be a case in point. We will fly, slowly but surely, through the towering mountains of the interior, to Lake Karluk in the south west, where our indigenous guides will meet us at the landing on Camp Island. Our lodge is situated on an island in the middle of a lake, so we are on an island in a lake in an island, if you follow me. 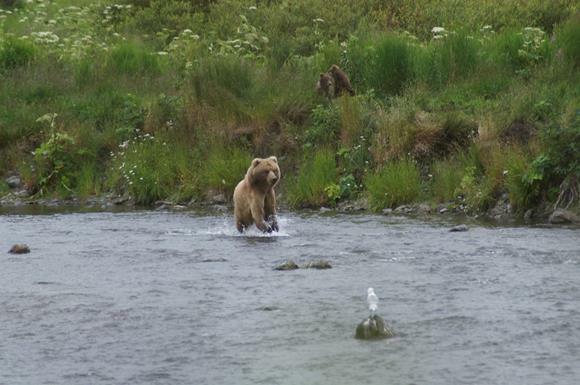 I figured they chose this spot to keep us safe from bears, but was soon reminded that bears can swim pretty well. In any case it’s a stunning location and the log cabins are great accommodation without being luxurious. Kodiak has many high-end lodges to cater for the wealthy visitors from ‘the lower 48’ who come up here in the Summer for shootin’ and fishin’. But the lodge I’ve chosen is owned and run by the corporation of the local indigenous community. It’s more basic than most of it’s competitors but it’s warm and comfortable and beautifully situated a short distance from a major salmon run. And most importantly we won’t have to share it with any one else. That’s a big thing for me. I want to experience nature without the crowds – I want to look up at the towering hills around the lake and imagine that this is exactly as it might have appeared to the intrepid Russians who first explored here 130 years ago. I want to get lost in the reverie, and that takes solitude. Dropped off at Camp Island. We'll be alone here for a week or more. For the next week or so we'll be getting in touch with nature in a way few people ever do. We'll slowly adopt the mindset of Natural History cinematographers, tracking bear in the long grass and waiting – as are the bears – for the salmon to cross the lake and head upstream to sporn. 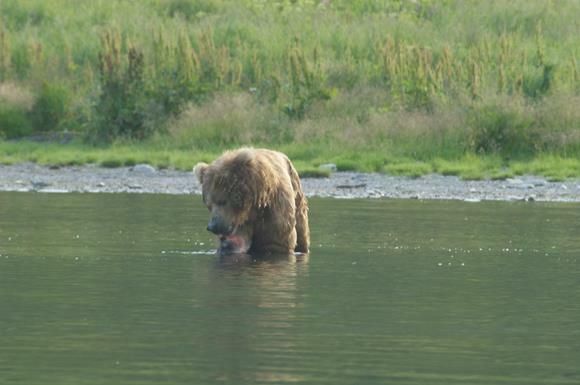 Waiting on one bank is us, the film makers, and on the other bank the bears who’ve woken from hibernation hungry and fixated on the high protein eggs being carried in the bellies of the salmon. Of course sometimes it’s inevitable we’ll be waiting on the same bank. 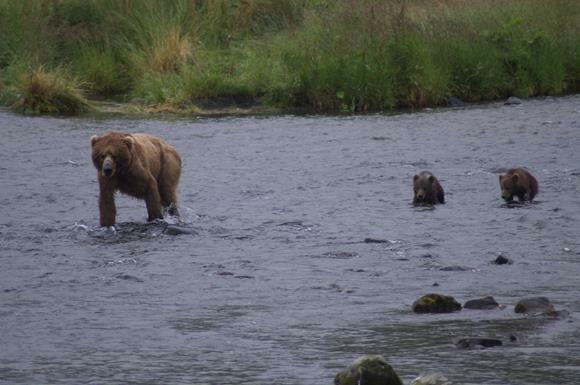 Don’t worry, our guides have a lifetime of experience in this wilderness and while we wait for the salmon they can regale you with facts about bear, red fox, river otter, weasels, salmon and eagle as well as stories about growing up as an indigenous person on this beautiful remote place. We can fly down to the village of Karluk where our guides grew up and learn more about the lives of the indigenous people of the island if that interests you. We can do a spot of fly fishing too. "pan right Zak, we've got company"
at last... 'lunch is served'. For me the greatest pleasure is spending a few days engaging with the natural world. It's not just relaxing, it's transporting. Bearing witness (poor choice of words!) 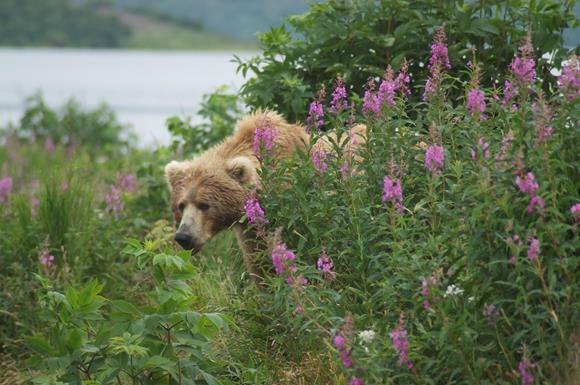 to the mighty Kodiak Bear in close proximity in a truly remote and pristine environment provides the rare chance to be relieved of one's own significance; to contemplate the rhythm of the seasons and the fragility of biodiversity. 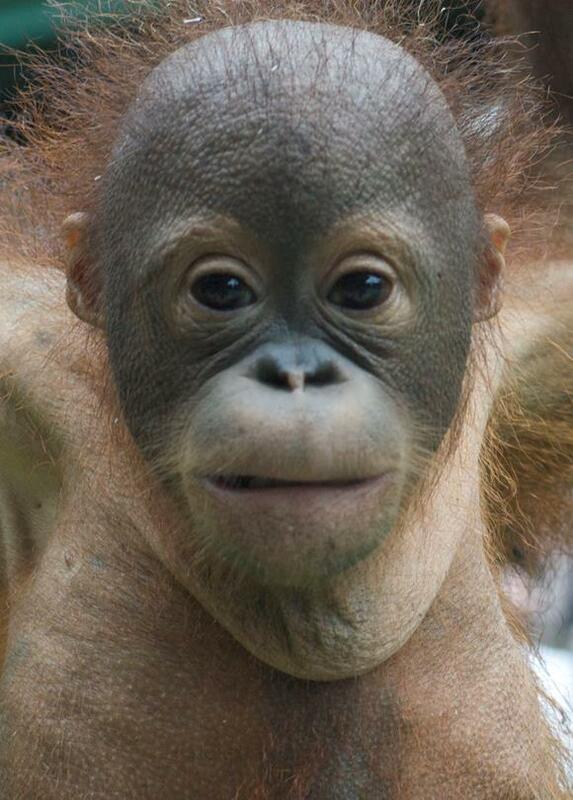 And the forthcoming Filmmaker Abroad trip to Borneo offers all of those same experiences. If you are of a mind to seek out that sort of experience you might want to consider a trip to see the amazing fauna of Borneo - before it's too late. The Borneo Filmmaker Abroad trip (28th October - 7th November) offers privileged access to a range of stories about Orangutan research, rehabilitation, the tragedy of palm oil production and access to the communities of the indigenous Dayak people. It is truly an 'experiential' itinerary. And we will do it in relative luxury with best available accommodation (all single supplement), charter flights between destinations to avoid the long arduous drive, and daily meetings to discuss progress and review rushes. It sounds like a sales pitch but if you have dreamed of going to Borneo to see what remains of this beautiful island there is no better way to experience it than as a filmmaker abroad. But don't wait too long. Places are filling fast and we will have to close the books soon. Strictly limited to 8 participants. "Come and tell the story of how I was orphaned near Pangkalan Bun."